Thailand is world renouned for delicious food, but I gotta tell you, this curry is a real treat. And you don't need to take my word for it. CNN Travel did a feature on the "World's 50 Best Foods" in 2011, and Thai Massaman Curry beat out ALL the other entries, and ranked as Number ONE! This is no small accomplishment. Not too spicy, and rich complex flavors. This is the only curry flavor that is mentioned in Royal Thai literature. One more reason to fall in love with Thailand. Consists of THREE 50g. 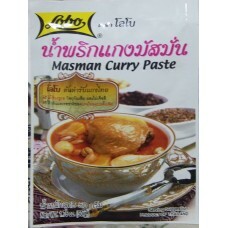 packs of Massaman Curry Paste. You will need locally bought: coconut milk, beef or chicken cubes, potatos, peanuts. See product images for more info and recipe. Allergen information: This product contains shrimp. 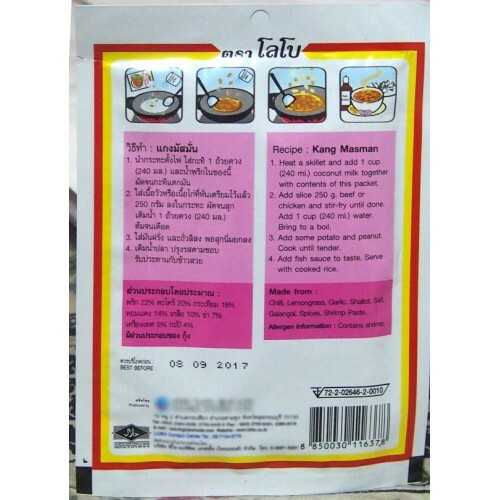 This product contains nightshade vegetables (chili peppers). This product is not vegetarian.